Hey everyone! 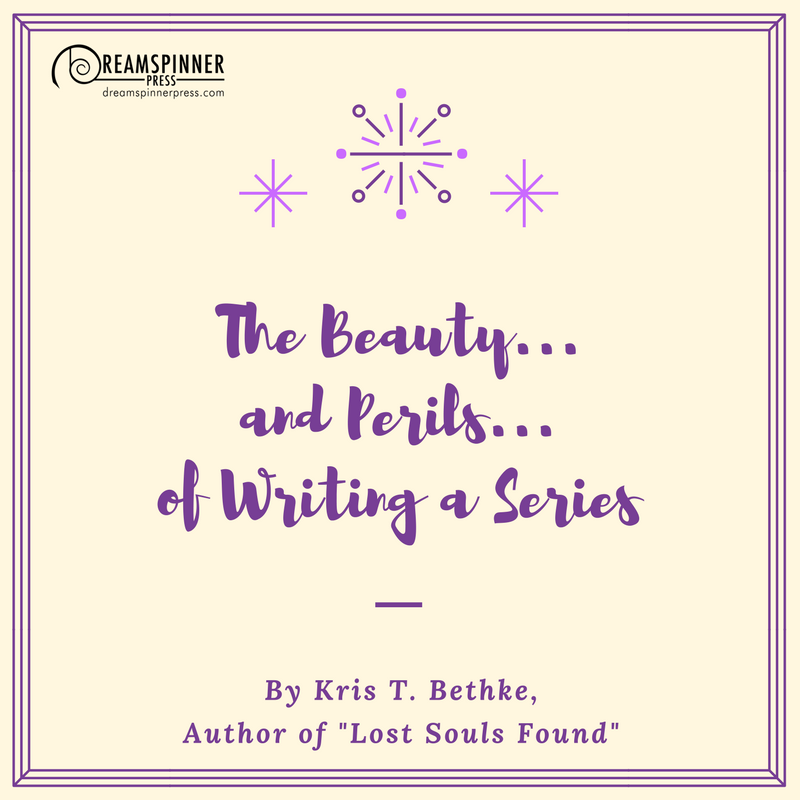 I’m Kris T. Bethke, and I’m here to talk about series. I love them. Like a lot. I love to read them, love to watch couples facing new dilemmas and trials while still being together, love to watch new couples find their happily ever after. Reading series is a true joy for me, and I’m more likely to pick up a book if I know there’s going to be more in the world that’s been created. I love to write series too. It never fails that, when I’m writing, the secondary characters talk to me, wanting their own books. While I have written a bunch of single titles, the truth is, even in most of them, I want to write more with secondary characters. The Requiem Inc. series gave me that opportunity. From the moment I started penning Ghost of a Chance, I knew Sam and Michael needed a book too. I was so certain of it, in fact, that I wasn’t worried about putting in hints and clues to their feelings for each other in the first book. When I got the go ahead to write Lost Souls Found, I was thrilled. But just because I have characters talking to me, wanting their own books, doesn’t mean that it’s easy. There are pitfalls I had to work hard to avoid. Because while, yes, it’s a series with a common theme, I had to be careful not to repeat the same story I’ve already told. I wrote that book, readers read it, and we all want something new. In a series like Requiem Inc., I also had to work at including enough information that each book can work on it’s own, while not repeating too much information so that readers who have read them don’t feel like I’m just covering the same territory. It’s a fine line to walk, and not an easy one, but it’s a challenge I enjoyed. 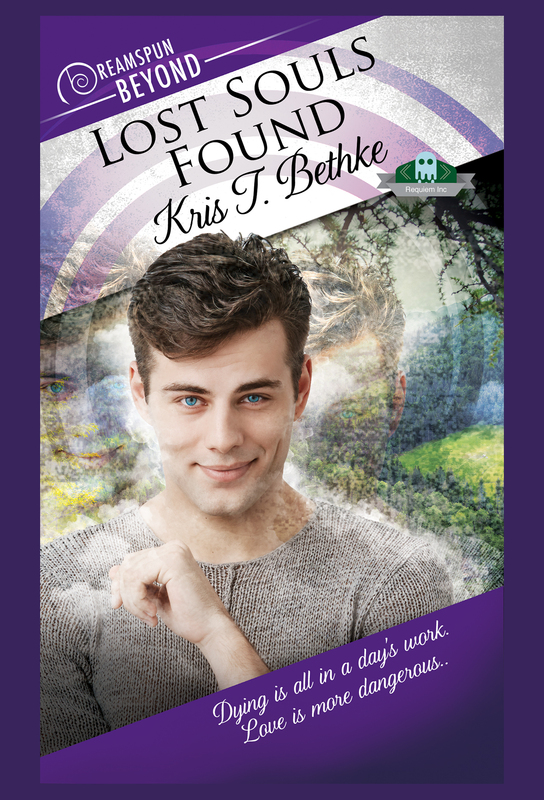 Lost Souls Found is out now, and it’s the second book in the series. But it’s different than the first. Sam and Michael’s relationship is a far cry from Blake and Derek’s. That was the fun in it for me. To jump back into the world of ghostwalkers, anchors, and Guardians, but to tell Sam and Michael’s story. There are new elements explored, and a totally different dynamic. 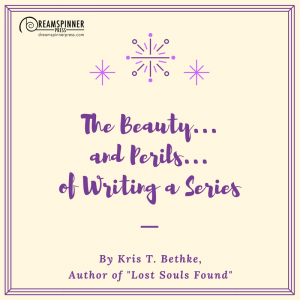 I love this series—it’s close to my heart for a lot of different reasons—and Lost Souls Found showcases why. Sam and Michael have a lot to work through before they get to their happy. Especially Michael. 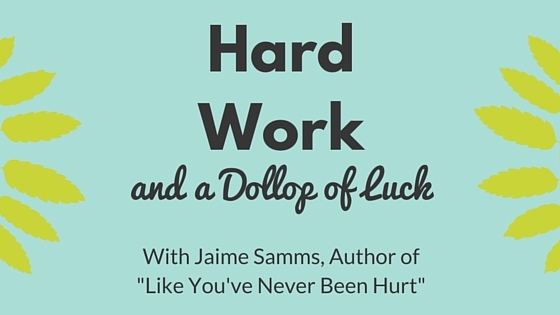 And Sam needs to learn just how far he’s willing to bend without compromising himself. I adore these guys together, and I’m so exciting they’re out in the world. I think they make a great addition to the series, and set the basis of what’s to come without taking the focus from their relationship. What do you think? Do you love series as much as I do? What works for you about them? Let me know! I’d love to hear your opinions. Check out Lost Souls Found today! 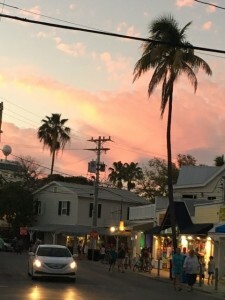 I was happy to set my novella In Over Our Heads in Key West. I’d been there once, briefly, many years ago. Briefly as in two hours on a stopover during a cruise. 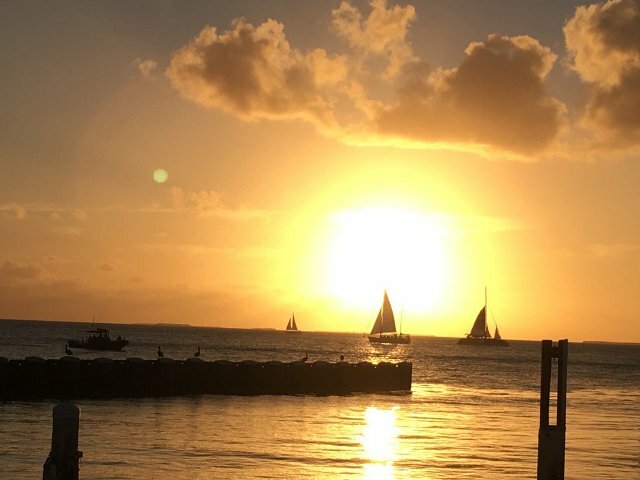 So I decided I needed a refresher on Key West and talked my sister into coming with me. We took off this past March from Orlando where I had just attended the Dreamspinner Author Conference. Road trip! 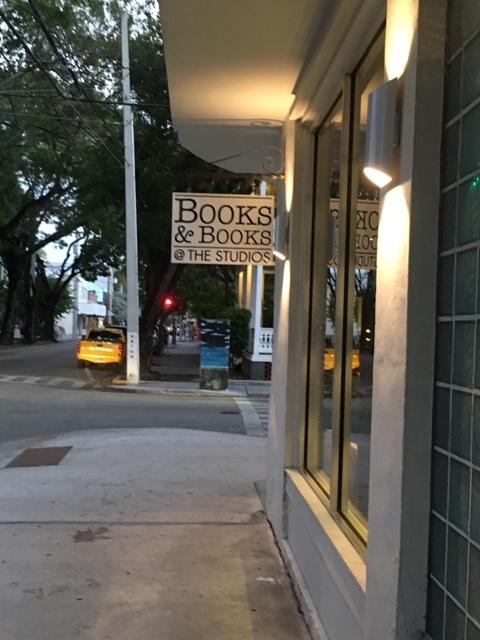 We made a pilgrimage to a local bookstore that’s owned by Judy Blume. She was there, y’all! I was too shy to approach her (or take her picture) and probably just as well, because I was sick as a dog and had a coughing attack in the store before I fled. Despite my ailments, I had a wonderful time in Key West and tried my best to capture its charm in the story. 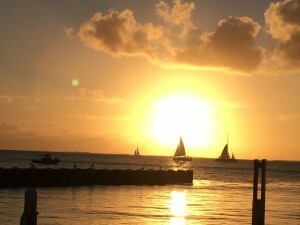 Here’s a Key West sunset for the end of this post—and yes, I took this picture with my iPhone. Key West is glorious! 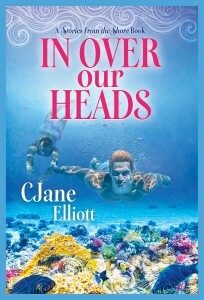 Check out In Over Our Heads today! Anthony Vallen is the life of any party. Full of energy and fun, Anthony adores romance and enjoys playing matchmaker for his friends while dancing the night away with a series of Mr. Right Nows. But he’s given up on his own happy ending. 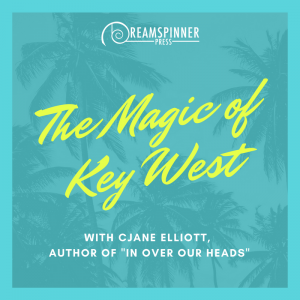 A bad breakup years ago made him a secret cynic about love… until he runs into Walter Elkins—the boy who broke his teenaged heart—on a scuba-diving vacation in Key West. Suddenly, Anthony’s reasons for shunning romance no longer hold much water. Being with Walter again forces Anthony to get serious—about himself, his worth, and his heart’s desires. Brilliant and self-contained, scientist Walter Elkins prefers deep thoughts to other people. He’s a good boss and a model citizen, but Walter doesn’t let anyone get close. 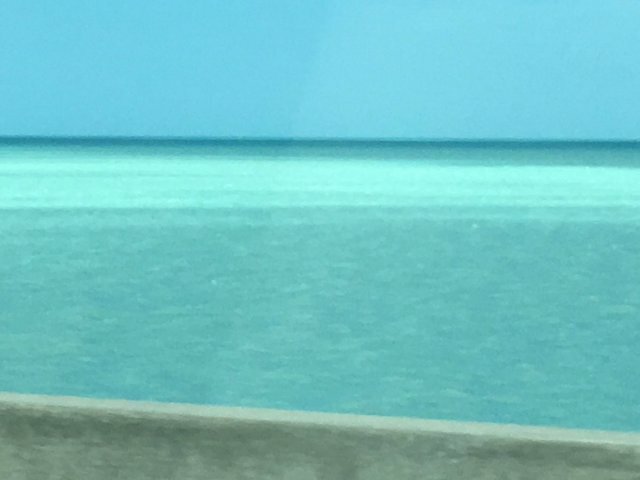 After a tragedy drove him out of his science career, Walter landed in Key West and became owner of a dive shop and a bar. Things are fine until Anthony Vallen—the only person who ever penetrated his defenses—shows up, and Walter’s calm, controlled life capsizes. 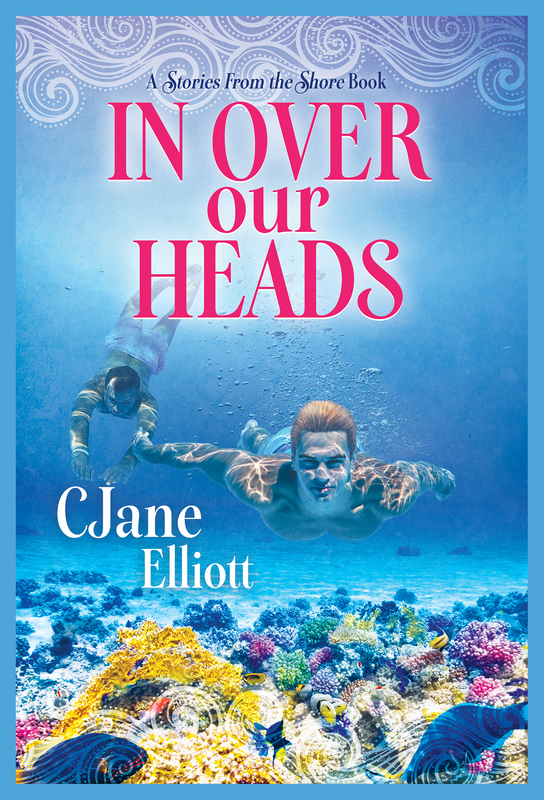 He and Anthony have a second chance for love, but Walter must confront the old fears that threaten to torpedo their happiness. Sometimes, life seems like a constant barrage of things not done. An endless parade of deadlines passing by unfulfilled, only to be followed by more obligations and things to do. The next book is due in this week. Edits for the book currently in production are due the week after that. Cover discussions for the entire series are ongoing. A release day requires blog tours and social media interaction. Really, writing the book, some days, feels like the easy part! When I was writing this series, it really was easier than some. I connected with the dancers in a different way than I connect with my other characters, because I have spent a lifetime (my daughter’s, to be precise) watching young dancers face these same struggles of identity, injury and the possibility that the thing they love most in the world is a thing they can’t have. Along every step, as some of her good friends had to stop dancing for health reasons, as some dropped out because they found other interests, and as a few went on to try and succeed or fail in the wider dance world, I’ve felt very lucky that my kid seems to be the charmed one so far. She’s talented and driven and knows what she wants, and moreover, looks like there is every chance she is going to succeed in achieving her goals. Because as creative and excitable as she is, she’s grounded and practical and knows what she can and can’t do. So she has set her goals and is moving in that direction at a steady, measured and hopefully, sustainable pace. Plus, luck. Never underestimate the power of luck. She has it, and it reminds me of many of the stages of my own career. Being in the right place at the right time is one part planning, one part talent, immeasurable infusions of hard, hard work, and a large dollop of luck. So when it came about, through chance, that this book is being released on my own dancer’s birthday, I felt the indelible hand of serendipity at work. I dedicated the book to her and sat back to watch the world unfold. Not only is this time of year her birthday, it’s tech week for the biggest commitment of her dance year. Which means rehearsals, production meetings, rehearsals, front of house organization, rehearsals, sleep if you can, eat constantly, because did I mention rehearsals? So really, who the blazes planned a release date in the middle of one of the busiest times of the year in this household? Because deadlines and rehearsals and promotion! Oh my! They say if you want something done, ask a busy person to do it. I hate to say it, but when I’m swamped, I simply get more done. Now if only that was a sustainable way of life. Thank goodness it only really happens twice a year or so around here. What about you guys? Do you get more done when have less time? Or are you one of those rare birds who plan your days and get things finished in a timely manner? Do people like that even exist? To dance is to put one’s heart and soul on display for the world to see and judge. Conrad, Peridot, and Cobalt always knew this. For years, this small group of men has danced in and out of the spotlight and one another’s lives. Now, settling in one place, one studio, they all have to find a place on the stage—or behind the scenes—and find the even greater strength to once more dance like no one is watching. To love like they’ve never been hurt before. But most of all, to live their lives like they have found their heaven, both in the music and in the eyes of those who love them. 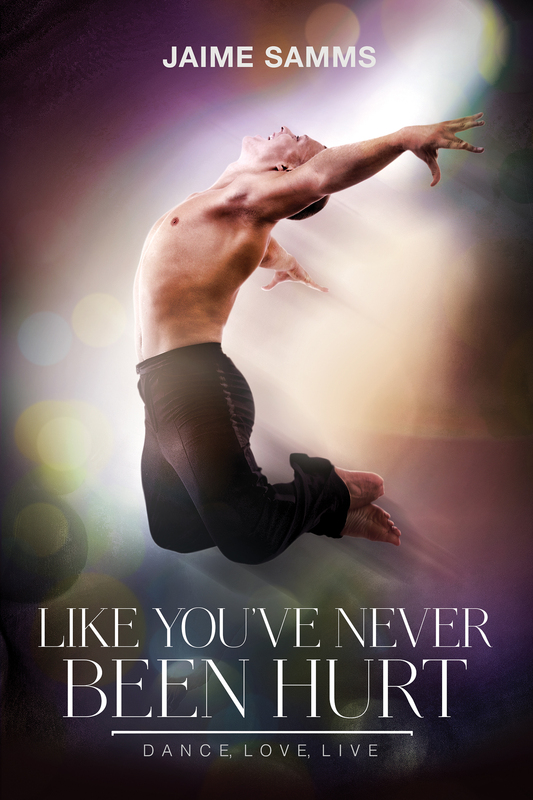 Blurb: About to lose the only thing he ever loved, Adam Pittaluga is at a crossroads in a dancing career that has hardly begun. He has always wanted to be a ballet dancer, but now that it’s impossible, he turns to Peridot for comfort. Peridot has been rebuilding his life after losing his ability to dance professionally, his marriage, and very nearly his daughter. He has a lot of reasons to be leery of starting something new, especially with a man as young as Adam. Adam and Peridot have to believe that starting again can lead to love and success and that sometimes, the strength needed to love like you’ve never been hurt can be borrowed from unexpected places for a while. But ultimately, they must find it inside themselves to be each other’s happy ending. Check out Like You’ve Never Been Hurt today! 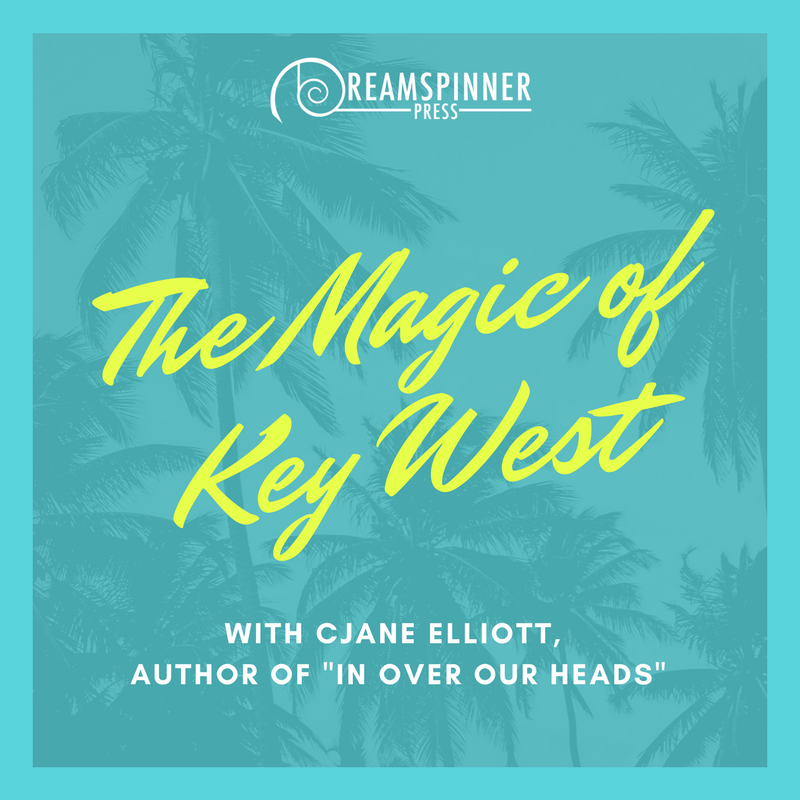 Jaime has been writing for various publishers since the fall of 2008, although she’s been writing for herself far longer. Often asked why men—what’s so fascinating about writing stories about men falling in love—she’s never come up with a clear answer. Just that these are the stories that she loves to read, so it seemed to make sense if she was going to write, they would also be the stories she wrote. These days, you can find plenty of free reading on her website. 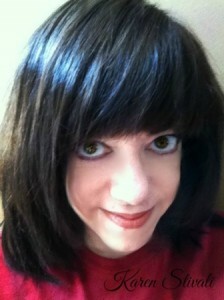 She also writes for Freya’s Bower, Dreamspinner Press, Totally Bound, and now, Riptide Publishing. Food has always been a big part of my life. Not only do I love to eat, I also love to cook. I come from a half Italian, half Jewish family and the main thing the two sides of the family had in common was a compulsive need to feed people! Many of my favorite memories from childhood involve food—special occasion meals, holiday treats, or just lazy days at my grandmother’s houses anxiously awaiting the next special meal or snack. 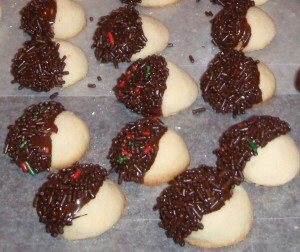 My grandmother’s butter cookies. I make them every Christmas. I’ve carried that tradition on to my adult life. I love cooking for friends and families, making traditional foods and trying new recipes. I’m pretty sure that whole need-to-feed thing is genetic, because if you’re at my house, odds are I’ll make you eat something! I’ve also carried on my love of food to my fiction writing. The characters in my books will always be seen enjoying meals together. Whether they’re dining out or preparing meals together or for one another, there’s always food involved. I think sharing food with people promotes bonding. It’s also a great way to create memories. There are still scents—a certain roast of coffee, a pot of tomato sauce simmering on the stove—that will transport me back to my grandmother’s kitchen when I was a kid. There are also foods I’ll associate with a particular trip—gelato in an outdoor cafe in Florence or fudge on the boardwalk at the Jersey shore—and if I smell or taste those things it’ll bring back memories of being in that place. Food can also become a ritual. Pizza at the same late night spot after seeing your favorite band play. A certain diner for weekend breakfasts. A favorite restaurant for birthday celebrations. You come to associate those places and foods with the people you’ve had the experience with. 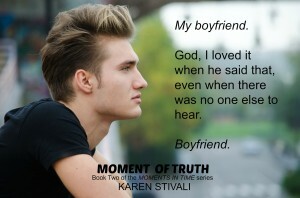 In MOMENT OF CLARITY, the third book in my Moments In Time series, Collin and Tanner wind up spending some time apart. During that time, while Collin is missing Tanner, he comforts himself with Chinese takeout from the place they used to go to together. It’s sad and sweet and comforting all at once. Mmmm….noodles. 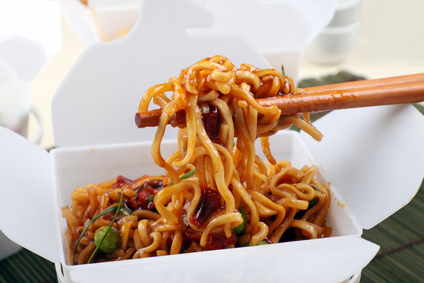 Why does Chinese food taste better eaten right out of the carton? What’s your favorite (or strongest) food memory? A holiday item you only eat once a year? A meal you grab with a favorite person? Something you haven’t had in a long time? Share your food associations and I’ll choose a random winner (later tonight) to win a copy of an ebook!. Release Party MOMENT OF CLARITY (Book 3 of the Moments In Time series)! Hi Everyone! 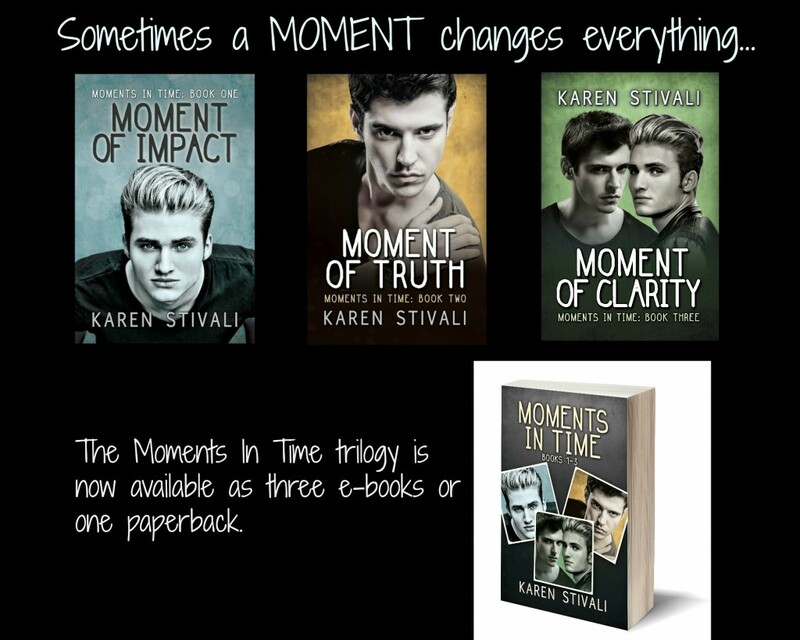 I’m Karen Stivali and I’m here today to celebrate the release of the third book in my Moments In Time series, MOMENT OF CLARITY. If you’re new to the series, let me give you a brief summary. All three books in this series are about college roommates Collin and Tanner. Book one, MOMENT OF IMPACT, is a coming of age/coming out story where they realize that they’re both interested in each other as more than friends. Not everyone is accepting of this, so they leave their conservative college town behind and spend the summer waiting tables on Fire Island in book two, MOMENT OF TRUTH. The freedoms to be publicly “out” as a couple, without judment makes for a summer filled with fun and exploration, but trust and jealousy are issues they have to confront in order to stay together. When the summer ends, they return to college for their senior year in book three, MOMENT OF CLARITY. Being back in the conservative environment proves challenging in even more ways than they expected. I know some readers worry that the books in a series will have cliffhanger endings. I assure you, that’s not the case with any of these stories. As a reader, I don’t like cliffhangers. As a writer, I choose to write romance because I’m all about the happy ending and I leave my characters in a good place at the end of every book. One thing has surprised me about readers of series, and that’s whether they read the books one at a time as they release, or wait until all the books are out and then binge read them. I guess I’m an old-fashioned girl. I’ve been an avid reader my whole life and I remember sometimes waiting a year or more for the next book from a favorite author. Even as recently as the Harry Potter books I remember pre-ordering the final volume and anxiously awaiting its delivery at my doorstep. It’s not that I like waiting—I don’t—but I love to read things as soon as they come out, even if that means a bit of anticipation and longing involved before I can get my hands on the next book. The same is true for TV viewing. If I find a show I like I’ll look forward to the weekly episode and axiously await the start of new season rather than skip the airing of the show and then Netflixing the whole season and watching it in a weekend. What’s your reading or viewing style? Do you like to wait until you can read/see all the episodes at once? Or do you need to read/see things right away? Do you like the anticipation or need to know you can see what happens immediately? Tell me in the comments and I’ll choose a random winner (later tonight–I’ll be here until midnight EDT) to receive a free ebook!